The Democratic parties in several counties (Cumberland, Durham, Forsyth, Guilford, Mecklenburg, Orange, and Wake), along with the NC Democratic Party as lead plaintiff, sued on Tuesday in the US District Court for the Middle District for a declaratory judgment and injunctive relief against the Republican General Assembly for eliminating judicial primaries in 2018. On December 16, 2016, the Republicans in the General Assembly restored partisan elections for judges and justices of the appellate courts, and on March 9, 2017, they did the same for judges of the district courts and superior courts. After 2006 judicial elections had been non-partisan. On April 4, 2017, the Republicans filed Senate Bill 656, the ironically named Electoral Freedom Act of 2017. A Proposed Conference Committee Substitute Bill for S.B. 656, submitted on October 4, 2018, added Section 4(a), eliminating primaries for judges and district attorneys for the 2018 election cycle. On October 5, 2017, the Republicans amended the Proposed Conference Committee Substitute Bill for S.B. 656 to restore primaries for the election of district attorneys but not for the election of judges. Partisan primaries are mechanisms by which the two major parties select from a range of candidates the single standard-bearer they want on the fall ballot. Taking away judicial primaries will deprive both Democrats and Republicans the right to vote for their standard-bearers (which is a constitutionally protected right, according to the court filing in the Middle District on Tuesday). judges into obedient servants of the current ruling class. Their apparent ultimate goal: They want Phil Berger making judicial appointments, or Phil Berger's lieutenants, so they're setting up judicial elections in 2018 for chaos. 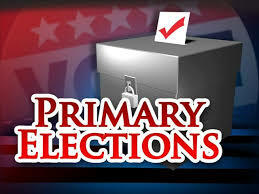 With no Republican and Democratic primaries -- with all judicial candidates pushed onto the fall ballot, bumper-to-bumper -- the voting public will be faced with long ballots of unknown and untested candidates. Winners of those races might get no more than 20% of the total vote, or less, under those circumstances. The only way to fight back at the moment -- because General Assembly elections are still a year off, when we might throw some of these cabbage worms back over the garden fence -- is via the law, the very mechanism that Republicans are busily working to knee-cap. RALEIGH, Dec. 13, 2017 -- Republican lawmakers asked Gov. Roy Cooper to send a representative to today’s Senate Committee on Judicial Redistricting to discuss the controversial changes that have been proposed for North Carolina’s court system. 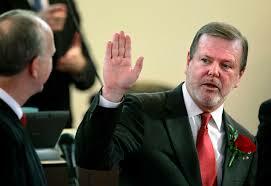 But when former Wake County Chief Superior Court Judge Don Stephens tried to speak during the hearing, Republican lawmakers prevented him from doing so. In response, Democratic lawmakers walked out of the hearing to protest the unfair and nakedly partisan treatment of a respected member of the judiciary. “This is far from the transparency we were promised,” tweeted Sen. Floyd McKissick, one of the Democratic senators who walked out of the hearing after his objections were overruled. In response to these attacks on our court system, a coalition of groups including the NC NAACP, NC Voters for Clean Elections, and Democracy NC have planned a day of action on January 10, when lawmakers return to the General Assembly.